No matter what I edit it doesn't appear to change much. I always research before asking questions. An I found this article about polling rate. https://gimx.fr/wiki/index.php?title=Mouse_tweaks. My mouse is a Corsair Harpoon with max dpi of 6,000, an hz of 1,000. Maybe lowering that may help. I can't get the command to work in a terminal though. Thank you. Once I enter that command it brings me to another screen. 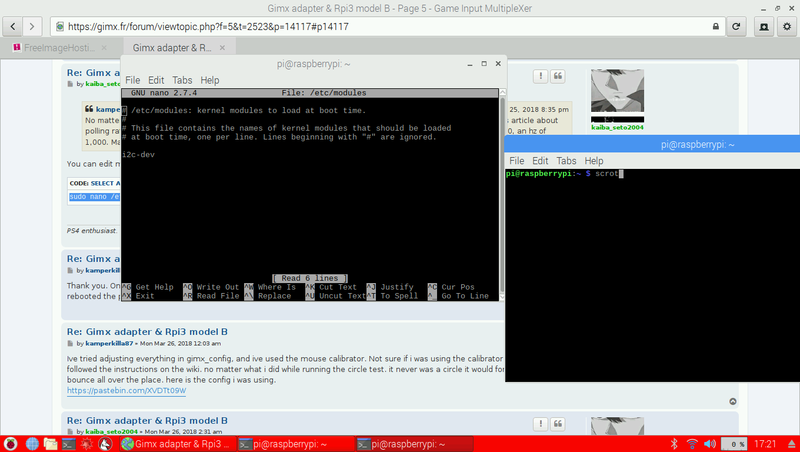 An I entered the command to change pollrate, saved it rebooted the pi. Upon boot it came up with some errors I managed to erase that command. Think I'm doing something wrong. Ive tried adjusting everything in gimx_config, and ive used the mouse calibrator. Not sure if i was using the calibrator properly though i followed the instructions on the wiki. no matter what i did while running the circle test. it never was a circle it would for the most part bounce all over the place. here is the config i was using. Can you show me which value you change to? About me, mousepoll=4 is my best choice. About circle test, you don't need a perfect circle, just balance x - y axis according to your feeling. You won't always have a perfect circle, some games have broken input mechanics. Just try to tweak it as best x/y as you feel it can be. BTW doesn't fortnite support mouse natively? At least on Ps4 it does as I played without gimx on mouse and it worked. @Godlike Xbox one doesn't support mouse an keyboard yet, but yes ps4 does. @kaliba_seto2004 I tried that one exactly. That's for 250hz, after rebooting. The pi came up with errors. I did not manage to change anything. I've tried editing the x/y ratios. No luck. An am I supposed to edit all of them? Cause there is x/y ratios in the gimx launcher with the curses option. X/y ratios in the gimx_fpsconfig, and it the gimx_config. On top of that there is two different options for the x/y ratio. Dead zone an acceleration. I appreciate the help everyone, but there needs to be thorough instructions on here or wiki for people that can't get it right. I've tried everything an nothing has worked. I'm sure I'm doing something wrong. The thing is I'm not sure what that is cause the lack of instructions, an meanings.